Over the summer, when I would go out at night to the chicken coop to make sure the doors were closed and everybody was inside, I would often see many cockroaches outside in the runs, scurrying about in avoidance of my flashlight. They would go for any oats or other chicken feed that happened to not be eaten by my birds and it was an unsettling site that made my skin crawl. I happen to HATE roaches! I was going to just put commercial roach traps both inside and outside the coop in order to get rid of those nasty bugs, but my son convinced me to first let him try a roach trap that he had read about online. Basically, you get a glass jar, put in some food or something to attract the roaches and then put some Vaseline inside the jar on the upper portion. The roaches climb in to get the food and then are unable to climb out because of the Vaseline. I was skeptical, but since I was afraid of the birds eating half-poisoned bugs, I let him try out his idea. Environmentally, his idea was better, but since these were roaches (UGH!) we were talking about, I didn't want to take a laid-back approach here…I wanted them GONE, and quickly! 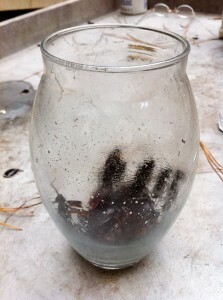 We've found that it may take a couple of days for the roaches to make it into the jar. We experimented with candy, just water, oats and regular chicken feed. 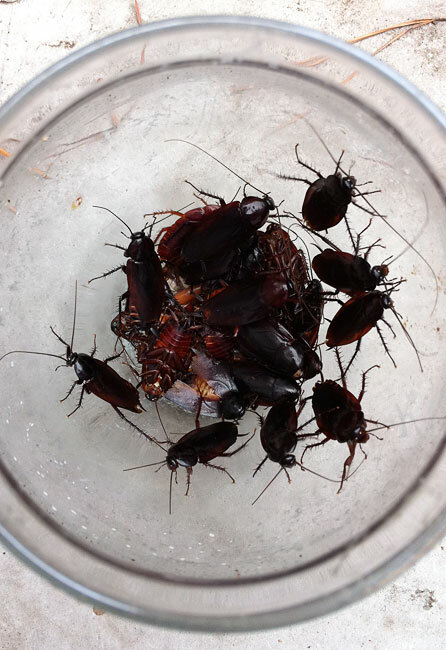 All of those attracted roaches (the candy also attracted ants) but the bigger indicator of which trap would catch the most bugs was the actual location of the jar around the coop. Cockroaches leave chemical trails and pheromones so they tend to exhibit group behavior. It is for this reason that my son always leaves a few in the jar in order to attract other roaches the next day. Only one of the four traps consistently catches roaches and my son believes that the “trail” is strongest for that one trap and each bug that makes it in is an extra sign for other bugs to follow. You may go days with nothing and then a bunch appear the next day like the jar is suddenly the popular place to be. 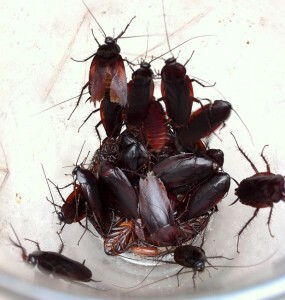 Supposedly, when daylight is approaching, roaches will try and find their own and group together. So if a couple roaches are in the trap, others may join them out of a sense of camaraderie. But whatever the logic, I am happy to lessen their numbers and at the same time, give my birds some extra protein. (You can't see it, but I'm cringing as I write…) Most of my birds love to grab them and run off with their prize. The juveniles and some of the hens do not know what to do with them and aren't as enamored with eating them like the others. As ecologically sound as this is, I have to admit that this is where I draw the line…I let Erik take long tweezers and feed the bugs back to the birds. Of course, if you are as grossed out by them as I am, you can fill the jar with an inch or two of water and the roaches will eventually drown and can be discarded in the trash. I may not eradicate them completely, since this IS the Southeast, but at least my seramas can benefit from the extra protein, and I don't have to be worried about poisonous chemicals. Thanks, Erik! I grew up in the south so I know about those icky wood roaches… one thing I LOVE about Idaho is that they do not live here. I do like your approach to harvesting this food resource for your girls! Bravo, & die roaches, die! Cool. I like that one. I am in Bermuda and they are a pain this time of year , in fact they have a joke here as to what is the National Bird – The Cockroach . I am going to try your Kids idea and theory out here . Group Behaviour ? I have sat outside and watched them fly in! But I think that that is some kind of reproductive process. I am going to add you guys to the Fav. list and update you as to my progress.Regards, Bayleaf The Gardener. P.S. What ideas for Ant Catching ?? I just read something about chickens getting eyeworms from roaches. Have you ever had a problem. I’ve never seen a roach in our coops, but that doesn’t mean the nasty little critters aren’t there. Love your beautiful little babies. No, I have never had this problem (Thank God), and this is the first I’m hearing about it. Roaches, or the Palmetto Bug as they’re called down here, are everywhere in the outdoors, so I do not hesitate to stomp on every single one I can! Reading this made the hair on my arms stand up…lol. They must not be a problem in my particular area, because I can’t recall seeing any around here. But I do remember them (or something similar) from old trips to Florida. Very clever in catching them but feeding animals is not a good idea. Roaches carry very dangerous diseases such as salmonella and many others you should dispose of them in a sanitary manner. Please be carefull!